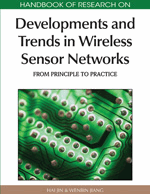 In this chapter, we study the deployment problem in wireless sensor networks. The deployment affects the efficiency and the effectiveness of sensor networks. We discuss different types of deployment strategies including deterministic or random deployment, and centralized or distributed deployment. We also review the measures of deployment while considering the connectivity and coverage in detail. The best coverage and the worst coverage are also discussed. An important issue is the energy efficiency in wireless sensor networks. We classify the power conservation issue into 3 types of sensor networks. They are duty-cycle dependent, role dependent, and topology dependent methods. Finally, future trends in sensor deployment are proposed. Limited Energy: A well-known characteristic is that wireless sensor nodes have limited energy and have difficult in recharging. According to the energy consumption model (Heinzelman, Chandrakasan, & Balakrishnan 2002), the longer the transmitting range is, the more energy the WSNs consume. For energy saving, proper distance among sensors is important for WSNs. Transmitting by multiple hops path is usually better than by directly (Heinzelman et al., 2002). The topology of WSNs affects the network lifetime considerably. Transmission Jobs: To prolong the lifetime of WSNs, we usually regularly schedule sleep intervals for sensors. Usually, multiple sensors sensing similar data will need to aggregate them to the source. Transmission jobs will cost a lot, if the WSNs don’t have uniform sensing coverage. Unprotected Area: The monitoring area is not usually protected, especially for military applications. To prevent being invaded, deployment information is a good option to key management schema for WSNs (Wenliang, Jing, Han, & Shigang, 2004), that is, deployment strategy affects the key schema. How to deploy a lot of sensor nodes into an area of interest is an important issue for wireless sensor networks. Usually, it affects whether the network operations are energy-efficient, robust, and reliable. Different deployment methods result in distinct routing methods. Varying routing methods consume sensor energy at a varied rate. That is, the deployment will affect the energy depletion and the lifetime of WSNs. Furthermore, various deployments lead to different sensor network topologies. Sensor connectivity will also vary. The connectivity of sensor nodes affects the robustness of WSNs. Consequently, how to deploy the senor nodes efficiently and effectively affects if the WSNs work smoothly and as desired. Since a deployment strategy is important for WSNs, how do we evaluate the strategy? Coverage (Gage, 1992) and energy-efficiency are two major concerns for deployment. Owing to the characteristic of WSNs with nodes easy to be damaged, using only a node to monitor a fixed area is unreliable. Usually, even a small area needs to be covered by several sensors. So, we can consider coverage the base of executing fault tolerance in WSNs. So, how do we deploy sensors in an interested area with finite nodes to achieve a better coverage? Because the sensing range and the communicate range of a sensor are not the same, coverage does not equal connectivity. To make WSNs work smoothly, we should consider connectivity while discussing coverage. We explain the coverage problem and related issues in the section of the coverage problem. We also study how to evaluate the coverage of an area. The benchmarks include the best and the worst case coverage. They help sensors to be deployed with better coverage. Another important issue about WSNs is its lifetime. If sensors were deployed unbalanced, nodes in sparse area will deplete energy soon due to more frequent data flow and more distant transmission range. Therefore, suitable arrangement of sensors will make WSNs more durable. Other strategies such as duty cycle based and role based are also used to help energy-efficiency. These methods are all mentioned in this chapter. The rest of the chapter is organized as follows. We discuss the classification of deployment strategy first. Then, we present a survey for the coverage problem. Next we show the energy-efficiency issue. The last section is the conclusions and future trends. Deployment Strategy: The method about how to place sensors in an interested area. Dynamic Network: In a WSN, it includes at least one mobile node. Connectivity: The connectivity is an important measure of its robustness as a network. A network has good connectivity, which means any node in this network can connect another directly or indirectly. Sensor network: A wireless sensor network (WSN) is a wireless network consisting of spatially distributed autonomous devices using sensors to cooperatively monitor physical or environmental conditions, such as temperature, sound, vibration, pressure, motion or pollutants, at different locations. Energy Efficiency: In a wireless sensor network, we need sensors to work in a longer lifetime. So, we need sensor with low energy consumption when they work. Static Network: In a WSN, sensor nodes are stationary and will not move after the initial deployment. Coverage Problem: The problem about how large is an area covered by sensors.